In April 2017, I suddenly developed lower back pain after lifting heavy suitcase. I continued to struggle to lift and bend over the following week due to aching and stiffness. Approximately one week later I woke during the night with terrible pains in my legs from my knee to the ankle, mainly affecting the calves. The pain was so bad I was unable to sleep. I visited to Doctor and a musculoskeletal (MSK) physiotherapist on a number of occasions for help with the pain. I also noticed that my legs felt weak, I dragged my right leg when I was walking and needed to start to use a stick. 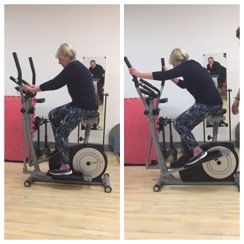 My mobility continued to deteriorate and I had a number of falls with my legs giving way. I also needed to stop driving as I couldn’t use the clutch or accelerator. In November, I saw a Neurologist and had a number of test and scans to try and find out what the problems was. He advised me to get a walker for my own safety. The manipulation I had had with the MSK physiotherapist had not helped. By December 2017, my hands were also affected. I struggled to dress and undress. I could not get upstairs or downstairs on my own, get up from a chair unaided or turn the oven on or off. I was struggling to hold a knife and fork and couldn’t cut up my own food. I needed help to wash my hair and put on my shoes and socks. 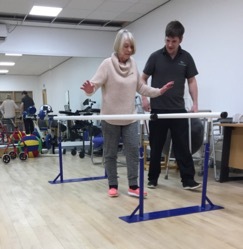 On the 8th December 2017, I had my first appointment with Tom at MOTIONrehab. 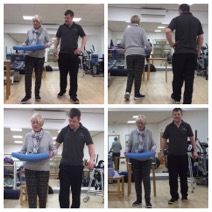 He did an assessment and we discussed my condition and what I hoped to achieve, along with some simple exercises. After the first two sessions I already started to see improvements in my ability to do things. Unfortunately, just before Christmas 2017 I fell again and badly twisted my right ankle. I could not get up off the floor by myself. It was so frustrating as I felt the fall had undone improvements I had made. 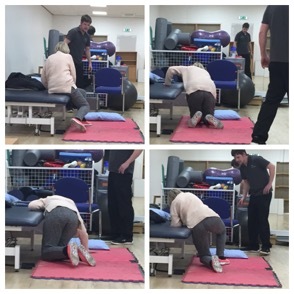 However, I continued to have neurological physiotherapy with Tom at MOTIONrehab between January 2018 and April 2018. Walk round a Supermarket with a supermarket trolley. Walk short distances outdoors with a walking stick. To date my balance is still as good as it was but I think this is a work in progress. I am so pleased with the improvements I have made but there is still a long way to go!